Half of the Danish court lies dead after a series of puzzling macabre events. It’s your job to untangle this mess and find out who did what to whom, why, when and how. To do this, you need to interrogate the gravedigger (you can do that in plain English). Apparently, he has all the information you need. The problem is that he’s a bit thick and might need some tight questioning. 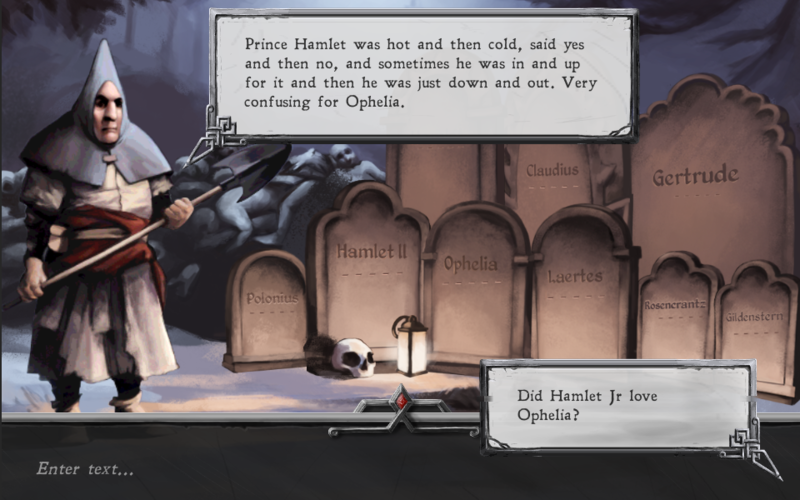 SimHamlet explores the potential gameplay of retrieving information from a reluctant or non-cooperative character. The game begins in the aftermath of Shakespeare’s play. The player is cast as a government official with the mission of clarifying the recent events to write an official report. A gravedigger must be interrogated in order to establish the ins and outs of each murder. He apparently knows everything there is to know however the process is complicated by the NPC’s idiosyncratic perception of the events, in which lies the challenge of the encounter. The LabLabLab Vol.1 compilation features the latest version of this game. SimHamlet gameplay from Jonathan Lessard on Vimeo.